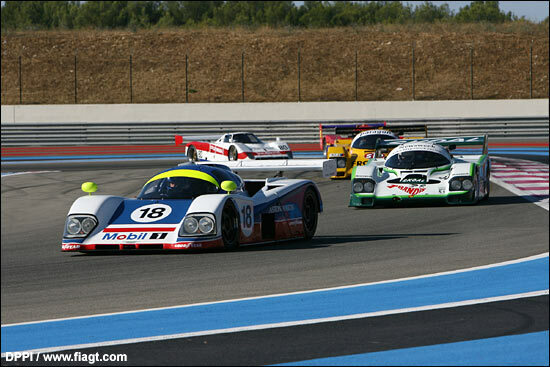 Jim Graham’s Group C/GTP cars were supporting the FIA GTs at Paul Ricard last weekend, with a 30 minute ‘sprint’ race followed by a one hour (optional two driver) 60 minute race on Sunday. A chicane on the Mistral made lap time comparisons with the GTs irrelevant. But Jim Graham points out that “a modern GT race car, with a professional driver, is now capable of approaching the times of a 15-20 year old prototype, with an amateur pilot, such is the progression of ‘road/race car’ development. 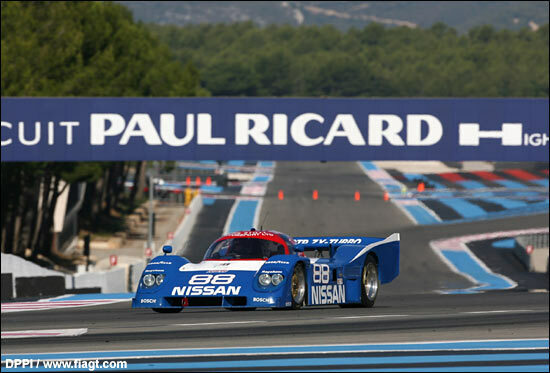 Chris Randall in the Nissan NTP1 GTP led the timesheets in qualifying, with a 2:05.090, followed by Paul Whight’s Aston Martin AMR1 and Philipp Brunn in Henry Pearman’s Skoal Bandit Porsche 956 (above). But Whight’s AMR1 had throttle problems in race 1, leaving Chris Randall to lead home Brunn in the green and white Porsche: it was the first win for Randall in this series. Jim Mullen and his Spice just managed to hold off Klaus Frers in his Porsche 962 for third, these two exchanging places several times. Meanwhile, Neil Clark in his ‘new’ C1 Spice chopped 14 seconds off his qualifying time as he moved smoothly up to fifth, past Oddie (Argo GTP), Rini (Jaguar XJR12D) and Nick Randall (C1 Spice). 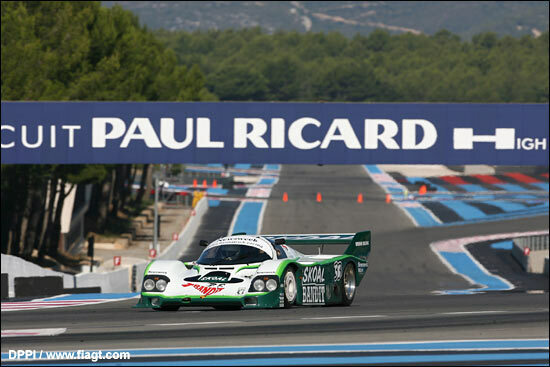 Nick Randall did it again in the one hour race, well clear of Mauro Pane and Justin Law in Nick Rini’s Jaguar XJR12, with Jim Mullen third again (his brakes fading by the end). Klaus Frers was fourth again, his race including a change to the rear wing settings mid race. Sometime British GT racer Ian Stinton joined Neil Clark in the #23 Spice, but gearbox problems intervened, while it was turbo problems that afflicted Henry Pearman’s 962 once he got in, although the problem was sorted out and the car did finish. Did Chris Randall's success have anything to do with his 'co-driver'? 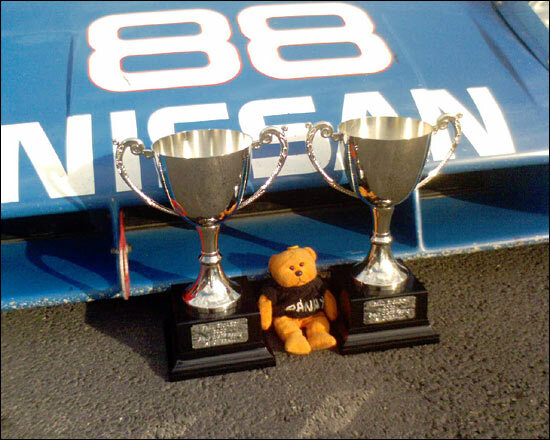 This little orange bear certainly seems to think so: "Apologies for my long stay of absence but I have been busy helping Phil Stott Motorsport develop the Nissan GTP prototype. It's been a long haul but my work here is now done and I will soon be back home. The fruits of my labour this year include 2 X 3rd 1 X 2nd and now 2 X 1st after getting the car really well hooked up at Paul Ricard. The team didn't want to let me go but it's about time I brought my good luck and driving talent to pastures new."